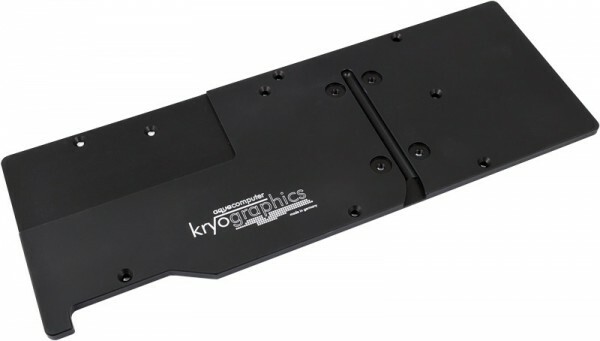 This back plate is manufactured from massive aluminum and can be mounted in addition to a kryographics GTX TITAN X water block, giving additional stability especially in the voltage regulator area of the graphics card. The back plate is anodized in black color and has direct contact to the RAM modules on the back side of the graphics card. Graphics card and kryographics water block are not included in delivery, please order separately. With some mainboards it may be possible that connector blocks (e.g. sound) or the locking mechanism of the RAM modules extend into the area of the backplate. In such a case the backplate can not be used without modifications.